From 1 January 2017 all lambs born in Victoria have had to be tagged with EID tags. 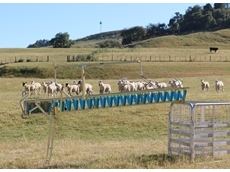 The Vetmarker from Fenemor Innovations is a marking chute that will put lambs on their feet once they have been released. 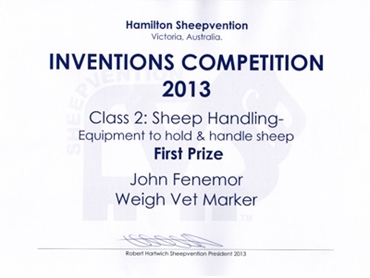 The Weigh Vetmarker has taken home first prize in the in the Class 2 category for Sheep Handling - Equipment to hold & handle sheep at the Hamilton Pastoral and Agricultural Society's Sheepvention event. Sheepvention is the Hamilton Pastoral and Agricultural Society's largest farming event, with over 25,000 visitors attending last year's show in regional Victoria. The show demonstrates the diversity and history of sheep in Australia, with the Sheep Show exhibiting up to 1000 sheep including Heritage and Merino breeds. 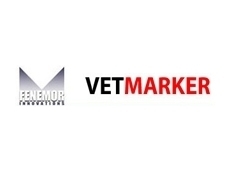 Fenemor Innovations developed the awards winning Weigh Vetmarker to enable farmers to efficiently weight lambs at marking time in a safe, and timely manner. 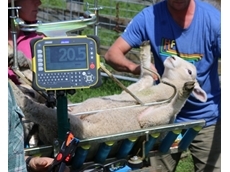 Lambs can be weighed automatically as soon as they are loaded into the Vetmarker and once weighing has taken place, the animal continues down the device for all other routine procedures. 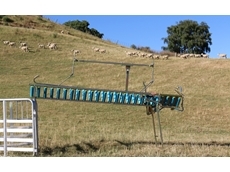 The Weigh Vetmarker self-locks onto the top rail of the lamb catching pen and features Iconix Load Cells with compatible leads for Tru-Test and Gallagher indicators. The Weigh Vetmarker has received rave reviews from satisfied customers including Matt Holden, who says that system has improved operation efficiencies on the farm. “The on-board scales are revolutionary especially with all our lambs being tagged at docking. To have the ability to monitor individual growth rates throughout lactation is potentially very powerful on farm information. With the clever design of the Vetmarker we felt no time was compromised with the lambs being weighed at docking time, in fact it was very efficient and the docking gang was impressed."